Character: Although borned in a middle-class family, no matter the way he acts, speaks or looks make people believe that Nuriko is a girl. Due to his love towards Hotohori, people believe that he is gay. 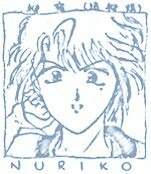 "A man's body, but a girl's heart", quote from Nuriko. He is a extremely hyper person. Since he's easily jealous, he always envy the relationship between Miaka and Hotohori ^.^ He, however, treats Miaka as if she is his sister.